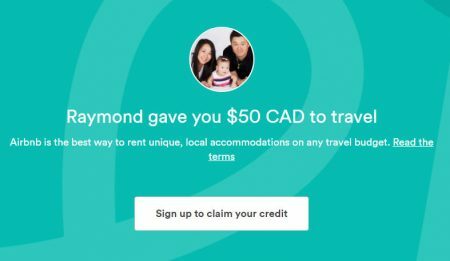 Airbnb.ca: FREE $50 CAD Travel Credit! Post Update: For a limited time, Airbnb has increased their free sign-up bonus from $40 to $50 CAD Travel Credits! Now’s the time to sign-up for an Airbnb account if you haven’t yet. For a limited time, click on any of the links in this blog post when you sign-up for an Airbnb account and you’ll get a FREE $50 CAD travel credit towards your first booking! Sign-up now while the offer lasts. Click here to visit Airbnb.ca to get your free $50 travel credit or for more details about the website.